After all the excitement generated during Comic Con it's worth rounding up the news around the Lost University. Unfortunately there isn't any news ! No new announcements or videos relating to the University were given at the Lost panel, however the video that is on the LU home page was shown. As many people have said in comments and on other sites this is more than likey just a marketing site. There has also been speculation that because there are two semesters that the first one will relate to the release of Lost series 5 and the second will relate to the start of series 6. "I did talk to the guy who is running the LOST auction in May. That's where they were handing out the LU flyers. He did say that he knew it will be a "real" on-line university talking about subjects relating to LOST, but it is not a game!" Many thanks to Maven and Scoutpost for their posts on the Comic Con 2009 Blog and for the pencil image above. There seem to be many clues or hints about Lost in it. This video is also referenced by an advert (left) shown in Entertainment Weekly. It has some other dates noted on it, which relate to the numbers and has the release dates of other videos in the series. Could this series of videos be the real ARG or just more promotion for series 6 ? "There are hieroglyphs on the print LOST/Kia ad that ran in Entertainment Weekly (they are on the film canister)-- could this have something to do with Prof. Nussdorf? Also, when you dial the # on the card and press the star key, you are asked for a password. (this is why there's a STAR next to the phone number) Has anyone cracked it? Could the ad contain the password? (maybe the glyphs?)" Is the * anything more than just the voice mail admin prompt ? There are two sets of potential markings the first are some Lost style heiroglyphs which is the more likely clue and the second is something that could look like morse code. Click here to see a rough translation from Lostpedia. "Who is the Leader ?" Der Merzmensch on his blog (which is mainly in the German language) has pointed us at some screen shots from the Mysteries video. In the screenshots some clearer pictures of the old newspaper clippings can be seen and one of these is for an old Radio station WAKY in Louisville, Kentucky. On one of the photos pages on the WAKY site there is a photo of a DJ called John Locke. There is also on another page an odd item that may relate to the potential heiroglyphics answer above. A bit of a marathon post, but I think it has all the relevant points. I'm thinking that all these elements we are seeing add up to a bigger picture, probably all related to the final series, and not specifically an ARG. However the glyphs on the film in the Kia advert and the possible password on the voicemail seem to be very ARG like. Intrancer - beaten by a few seconds ! In the Lost Mysteries video there is so much stuff that could be clues. It would take ages to go through it all. About Lost University: indeed, it seems to be not an ARG, but something like edutainment, and I'll apreciate it if some real scientists will explain thing. Perhaps elsewise we cannot understand Season 6? Der Merzmensch - Thanks for posting the links, your blog post has a lot of useful screenshots. I'm not sure the funeral directors and WAKY radio is significant as these appear to be a real business and radio station, personally I think these are just materials used in the production of the video. I do feel that there is something fairly significant in there so keep up the good work. On the WAKY radio page found by Der Merzmensch - there is a photo on page 3 of the photo's section with a name of a DJ called 'John Locke'. Also on page 4 there is something that ties in with the Lospedia translation of the heiroglyphs on the Kia Mysteries of the Universe advert. Please have a look and make your own minds up ! I think you're right with the real companies - they are perhaps red herrings, or perhaps there's something in the story about it. I was free to imagine the possibilities like: the funeral society might mean a dead person, who has something to do with Dharma. And radio station perhaps stays for an interview about Dharma or phenomenons or something like this. Again, these are just wildest speculations :-) I wonder, if we could find another clues there. Zort: Thanks for using my pencil pic! You and Der Merzmensch are doing a fantastic job trying to figure out what's going on with the Mysteries stuff. Keep up the fascinating work! 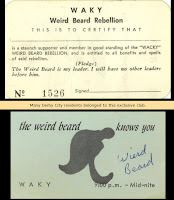 WAKY appears to have been a top 40's radio station of the 60's and 70's. That would tie in with Dharma. I tried a few number combinations on the Lost University phone line after pressing the * button, but none have worked so far. Also I can't believe that I live in southern Ohio and don't remember this station. We listened to WLW and WKRC in Cincinnati. (No not WKRP lol). Then in the evening and late at night we could get WLS in Chicago now that was a cool station. OK, people, my patience is very weak. I'll email the WAKY radio station now and will ask them, whether they do know this band Geronimo Jackson. This all may be a complete and utter coincidence as the WAKY site looks genuine, it just happens to have the name of one of the characters from Lost and a more tenuous link to the, possible, answer to a set of heiroglyphs ! I'm very appreciated to visit your homepage - the story of WAKY radio station is really great. I am almost sorry not to live in these times and not to listen to your channel (alas, the most radio channels nowadays are streaming just mainstream popmusic). I'm actually looking for a pretty unknown music band named "Geronimo Jackson". They were founded in 70ties and as far as I know the band grounder was Keith Strutter from Kentucky. Their only album, Magna Carta was pretty successful, as far as I know. So perhaps you have heard about this group? Since your radio is from Kentucky too and you have broadcasted many great interpreters, I just hope, you have once broadcasted also Geronimo Jackson. I would be glad to find some information, since all the data I found online is not really useful. And sorry for bothering you. Now perhaps, perhaps must surely the radio is OOG. But perhaps they had just a contract with JJ Abrams [sounds like contract with Mephistopheles, hehe]: they will build some fictional tie-ins in their history, and as reward they will get attention from huge audience worldwide. Oh don't worry this group won't kill you. We follow any kind of clue anywhere, we don't care. That's all part of the fun. Hey, you're doing great Merzmensch! I'm looking forward to seeing if you get a reply. If the radio station is authentic in the real world, I wonder if they pronounce their call name as "wacky". Capcom, when you go to the main page a sound is played that is "wacky", apparently know nas the WAKY Shout. However at the moment we may have crashed their servers as the site is currently unavailable. Ah ha it's back now, WAKY Shout and all. It happens all the time doesn't it. Remember the paper that had Jeremy Bentham's obit in it? I seem to remember phoning a takeaway food place that Jorge Garcia had posted as part of a clue. They had no idea what I was on about ! Why would they, TPTB, go through al this trouble to hide clues and glyphs if there was no ARG? Is there no ARG? Didn't they only say that LU wasn't a game? Hi guys. Was tipped off about the Waky thing and popped on over. I ran a WhoIs check on the site, and it's fully legit and all.. I don't think it's ARG-related as evidence currently suggests that they're running the filler content to S6 fully in-house on ABC sites. The Lost University thing is apparently going to just be videos from the S5 DVDs, mixed online as an interactive experience with a few tests. 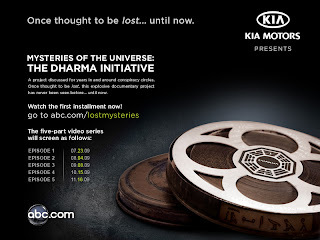 The actual mythology advancement will be seen in the Mysteries Of The Universe, which Lindelof has said will advance our knowledge of the DHARMA Initiative. Hi Nick, yes the WAKY site is definitely a legit site. It may just be that some researcher found John Locke as a DJ and included the WAKY invoice to get the conspiracy theory juices flowing. I've got difficulty in accepting that this a clue to a larger picture as WAKY seems too real and out of the loop to be true. However I'm keeping an open mind and following the trail, even if it is going nowhere. I am unsteady about the WAKY radio right now. On the one hand, sure, abc run all their contents at the own websites (to prevent gamejacks etc.). On the other hand, Paramount Pictures, as they promoted JJ Abrams' Cloverfield, dropped some hints at the completely unrelated pages, like menuism (where they created a fictional restaurant, among the hundreds of real existed) or scientific forums etc. One mystery that seems to be real is the password for the Lost University Phone Number, when the * key is used. ARG or not it's a tempting puzzle to solve. I'm assuming said password is numerical. In which case, the numbers? In the viral phone numbers fot JC Hutchins' "Personal Effects: Dark Art" all the phone passwords were four-digit.